Do you have some taster class? TT demonstration in my area? Can I Join to a Tango Therapy session? Tango Class or Tango Therapy? Practicing after the the sessions? Requirements to be Tango Therapist. Talking about the biological structure, tango improves mobility and physical abilities; its practice improves several aspects of health. Also, it develops the superior cognitive functions because it is necessary to pay attention to the steps. Tango dancing is beneficial to the elderly because it incorporates elements found in standard neurological rehabilitation programs: forward, backward and side to side weight shift; one leg stance; walking on a straight line both backwards and forwards; increasing step length in all directions; and turning within a narrow space, says Patricia Mc Kinley. An added benefit to tango is that its movements are performed to music, which is known to facilitate performance of ambulatory activities. A research in Australia suggests that tango may help people fight depression. An University of New England researcher, Rosa Pinniger , has been running a trial to see if concentrating on dance steps keeps negative thoughts away. Psychologists use it to try to help people fight negative thoughts and see situations more positively. Ms Pinniger says many studies have shown that meditation can be helpful in learning to do this. While studying the benefits of meditation she realised the brain works in a similar way when dancing the tango. “While you’re doing tango you can only be in the present – you really have to focus, concentrate, and it doesn’t allow your thoughts to drive into your mind,” she said. “The same with the tango – everyone walks and as long as you can walk you can tango, and this is the truth. Ms Pinniger says the participants in her trial have kept coming back to the tango classes because they can see results. “If people can have a break from their negative thoughts for three minutes – which is the time of the tango – they can realise that it is possible,” she said. Recent research has shown that dance, specifically tango, may be an appropriate and effective strategy for ameliorating functional mobility deficits in people who are frail and elderly. Individuals with Parkinson’s disease (PD) experience declines in functional mobility that may be even more pronounced than those experienced by frail elderly individuals without PD. This is the first study to systematically investigate and compare the effects of dance and strength/flexibility exercise on functional mobility in people with PD. We have demonstrated the feasibility of tango movement sessions for individuals with PD. While some significant changes in measures were noted, these changes were small and may not be clinically meaningful. Future studies with a larger sample size are needed to confirm and extend the present results. This work may ultimately lead to improved therapeutic movement approaches employing dance as an enjoyable and effective strategy for addressing functional mobility deficits in individuals with PD. These preliminary data suggest that dance may be a beneficial group activity to address balance and gait problems specific to PD. For downs syndrome and disabled children we can observe a clear motor response to rhythms. One way of rehabilitation of these children is through the sensory motor adaptation to different types of rhythm and seeing when they are able to pass from rhythm towards the melody, which is a great evolution. The Tango music with its particular rhythms and sweet melodies helps this rehabilitation ,also, the process of learning the steps and figures with a partner is a nice challenge. The strong rhythm can give them a sense of identity, of feeling good and the softer melodies a creative push. The AMAR (Association Dance Group of Argentina), say that downs syndrome people can absolutely be devoted tango dancers. It is absolutely true, it just takes patience and passion on the part of the teacher! Rosa Pinniger is an honours student at the University of New England (Sydney – Australia), where she is studying cognitive and behavioural therapy. 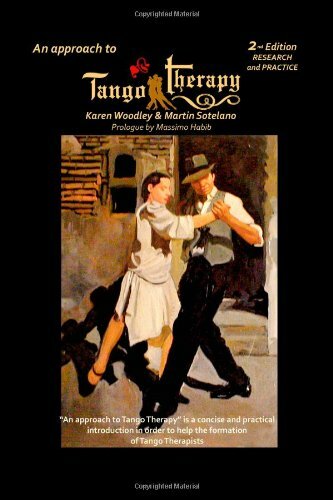 Copyright © 2019 Tango Therapy UK | Martin Sotelano | Karen Woodley. All Rights Reserved.